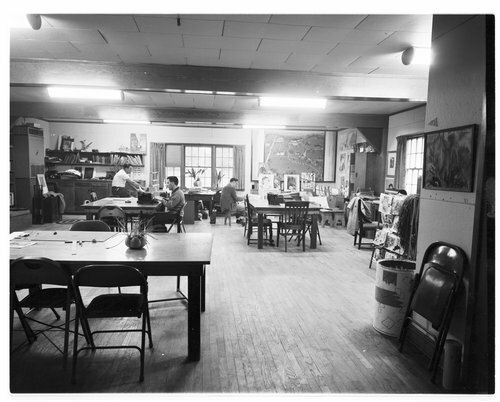 These photographs show the Arts and Crafts building of Menninger Clinic, East Campus as it looked in 1952. It later became the Canteen. The staff members in this photo are Emmett Downing, Don Jones, and Red Pratt. Note the mural in the right background. The next photograph is a close-up of the mural to show its depiction of the east campus -- its buildings, trees, and gardens.